Billionaire Donald Trump had already slammed the US president, Democratic front-runner Hillary Rodham Clilnton and his Republican rivals in the race for the White House, as well as immigrants from Mexico, the Chinese and Senator John McCain for being a prisoner of war. To that fast-growing list he has now added Fox News Channel host Megyn Kelly (Pictured, right). The Republican Party has long wrestled with the public perception that it is waging a “war on women'' and has struggled to convince more women that it's on their side. And yet for the outspoken, combative Trump, Kelly would seem to represent a type of person primed to get his goat. At 44, she is recognized as successful, whip-smart, commanding and, as she demonstrated during Thursday's first Republican presidential debate, a woman more than ready to stand up to the 69-year-old billionaire. Trump's position on women might be signaled by his proud ownership of beauty pageants and by his wisecrack on a TV show a decade ago that he would date his own daughter, a former teen model who was then 24, if only he weren't her father. But her appearance on Fox News Channel's “Media Buzz'' was taped Friday, before Trump made his “blood coming out of her wherever'' remark. Since arriving at Fox News in 2004, Kelly has broken out as a superstar. Her prime-time program, “The Kelly File,'' which she launched two years ago in an upgrade from her afternoon slot, attracts upward of 2.5 million viewers _ a high figure for a cable television news show. A native of Syracuse, New York, Kelly had been a self-described “unhappy Washington lawyer'' when she began as a weekend reporter for a local Washington station in 2003. A year after that, she was hired by Fox News chief Roger Ailes. There she struck a different chord from the partisan hosts who surrounded her on the schedule, carving out an image as a calls-‘em-as-she-sees-'em yet not-so-doctrinaire figure. Kelly has cultivated an image of speaking up in ways that have even run counter to Fox's image. On election night 2012 she left the set to go interview Fox's behind-the-scenes numbers analyst, tamping down the embarrassment of on-air contributor Karl Rove questioning the pronouncement that President Barack Obama had won re-election. Her legal training helped Fox correct, quicker than its rivals, an initially wrong report on the Supreme Court's health care decision in 2012. In June, she landed an exclusive: an interview with two of the Duggar daughters who had admitted to being sexually fondled by their brother, Josh Duggar, all stars of the TLC reality TV series, “19 Kids and Counting.'' Kelly also interviewed the parents, Jim Bob and Michelle Duggar, for what was the family's first discussion of the molestation episodes a dozen years before. 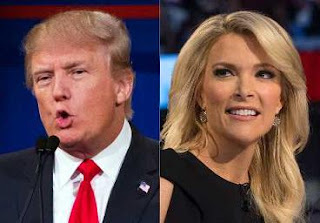 Kelly's latest showcase was joining fellow Fox News colleagues Bret Baier and Chris Wallace to moderate Thursday's debate with Trump, the current Republican presidential front-runner, and nine other contenders. By Friday, Trump had seemingly decided to be less nice. That startling outburst cost Trump an appearance before some 1,000 conservative activists at Saturday's RedState Gathering in Atlanta when he was promptly was declared not welcome at the event. The Republication Party asked him to “immediately clarify'' his remark. Saturday evening, he and a campaign adviser parted company. But Sunday, Trump remained defiant. “I apologize when I'm wrong, but I haven't been wrong,'' he declared, saying only “a deviant'' would interpret his remark as a gynecological swipe. Despite a series of attacks by Trump that fortified his standing in the polls, CNN's Jake Tapper asked if targeting Kelly, “who's beloved by conservatives, beloved by Republican voters,'' might end up hurting him.